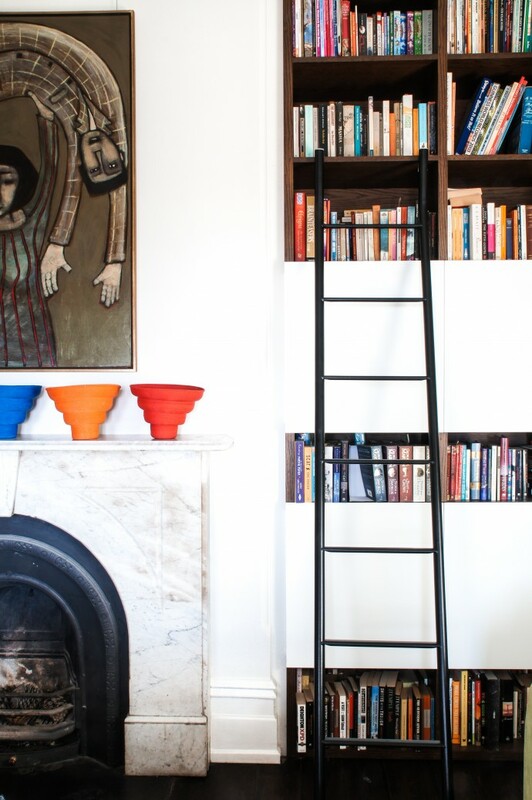 Expect the unexpected when you walk through the doors of this rock star Australian home. 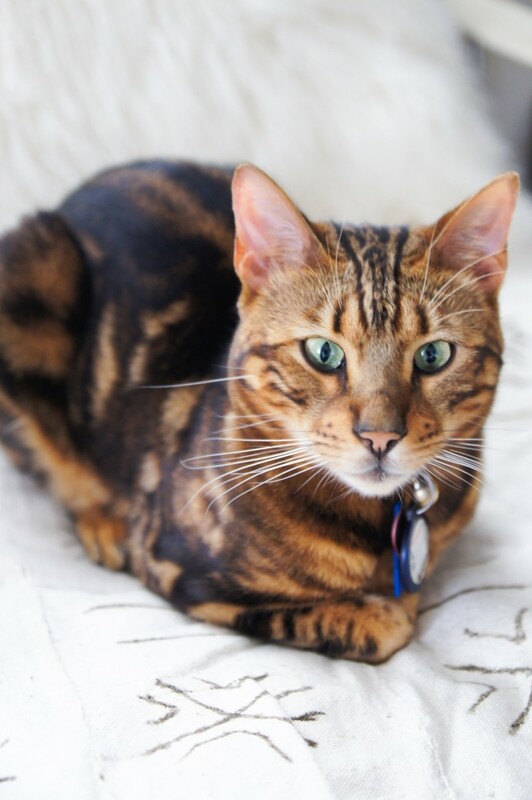 ‘Huntingtower’ – the story filled, fun home of Caecilia and James Potter, their boys Jasper and Cyrus and two cats Cicero and Francis Bacon. Photo – Changwei Dean. Production – Martine Harte. 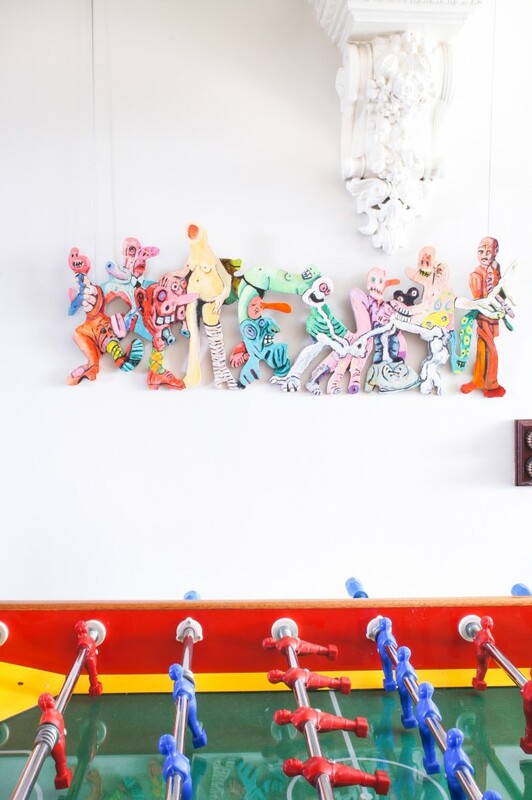 It’s playful, contemporary and influenced by a bond between two creative souls; home owner Caecilia Potter and her mother Julie. Caecilia Potter remembers her mum as a woman who created special moments in everyday life; candles at dinner, cut flowers from her garden, music and a love of books. Come on in, absorb each fantastic room and see how the ‘celebratory gene’ has been passed on. 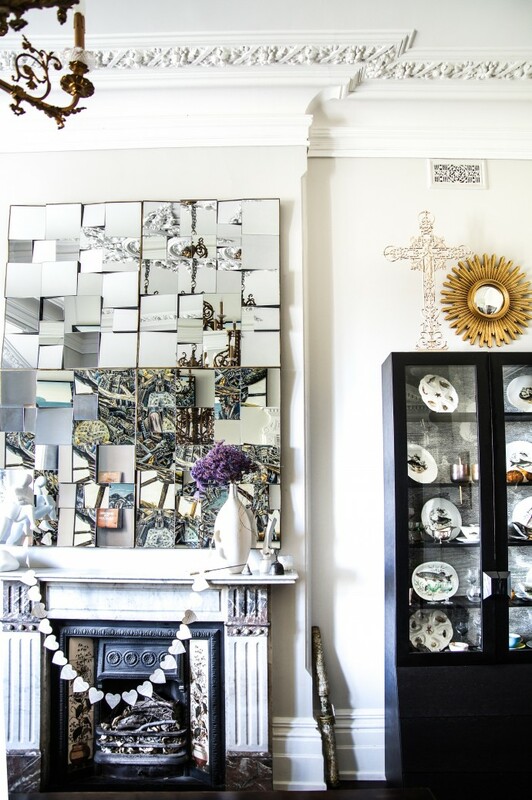 Formal dining room – four mirrors mounted as one from a junk shop. Display cabinet by Zuster. 18th Century French gilded chandelier came with the house and was originally in the hall. Photo – Changwei Dean. Production – Martine Harte. 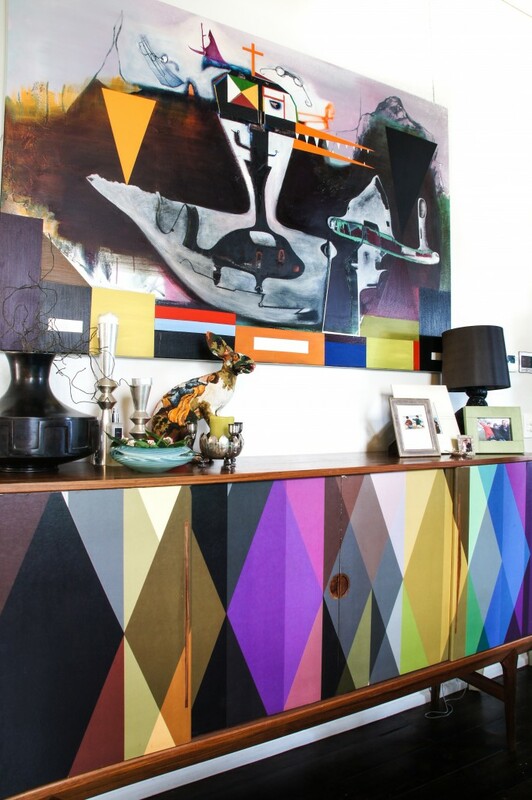 50s Danish sideboard refurbished by Caecilia with wallpaper ‘Circus’ by Cole and Son, Painting ‘God’ by Gareth Sansom. Hare one of their “little friends.” Photo – Changwei Dean. Production – Martine Harte. Photo – Changwei Dean. Production – Martine Harte. 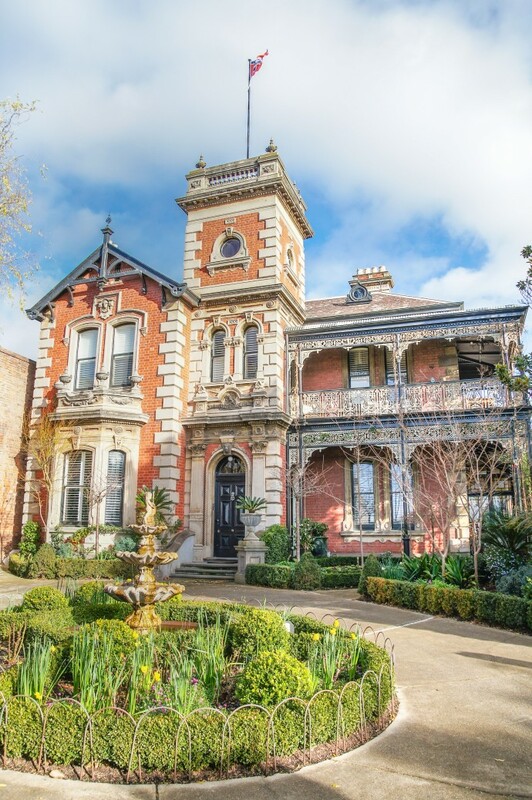 The Potter’s were originally “just going to have a look” at the home in Melbourne’s Hawthorn. “I went up in the tower with Cyrus and there was a gentleman and his wife (in their fifties) and she said to him, “Oh look I don’t think they’ll let you knock it down because it’s heritage listed.” He mumbled something and then Cyrus came down the stairs with me indignantly and said, ‘Why would anyone want to knock this down? Mum it’s terrible.’ It’s the first house we showed Jasper that he showed any interest in, he really connected with it,” recalls Caecilia. 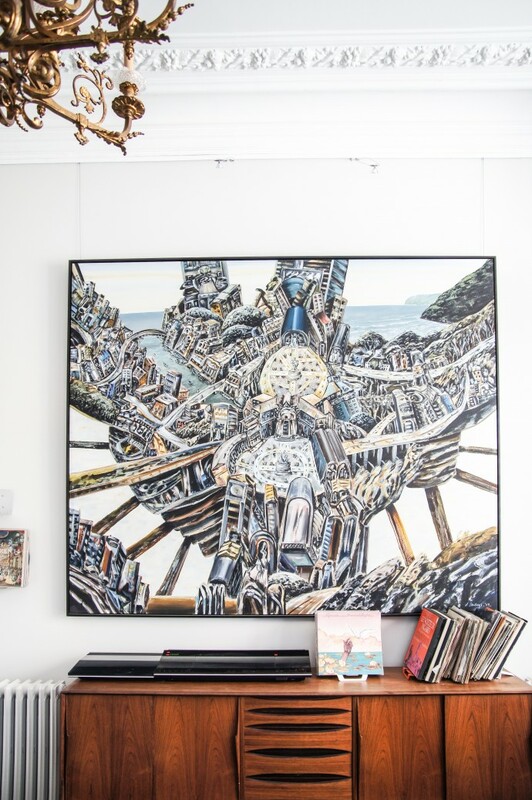 Painting ‘Otways and old world memories’ by Dobell Prize winner Jan Senbergs, Old Bang and Olufsen and records. Photo – Changwei Dean. Production – Martine Harte. “We’d just got back from a trip to Venice and the view from one side of the painting is almost like the view from our beach house in Fairhaven and the boys loved it. It’s been such a lovely thing to have in the dining room because I always think the dining room is one of the most special rooms, family meals are really a big part of how we connect with the kids.” Chinese artist Guan Wei’s cloud series bronze and white paint sculpture adds a lightness to the room, Sofa upholstered in Stroheim and Romann Cotton Strie, Zebra rug from South Africa. Photo – Changwei Dean. Production – Martine Harte. 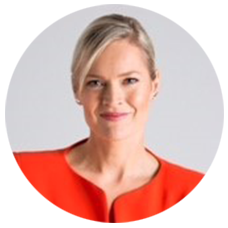 As Design Director of architecture, interior and landscape design practice Atticus & Milo, Caecilia doesn’t have a ‘signature style’ she believes a home is created by layering spaces to reflect a client’s individuality. Her home is full of wonderful conversation starters yet isn’t pretentious. 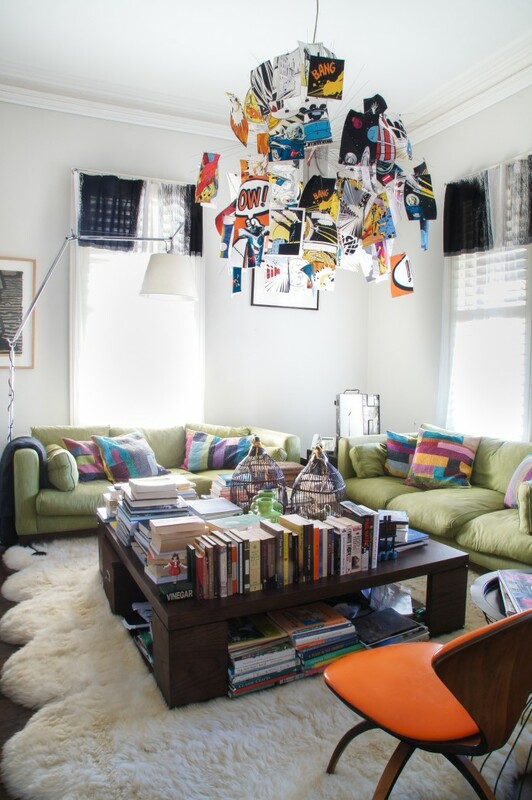 Yet another book filled room the upstairs den, Photo – Changwei Dean. Production – Martine Harte. 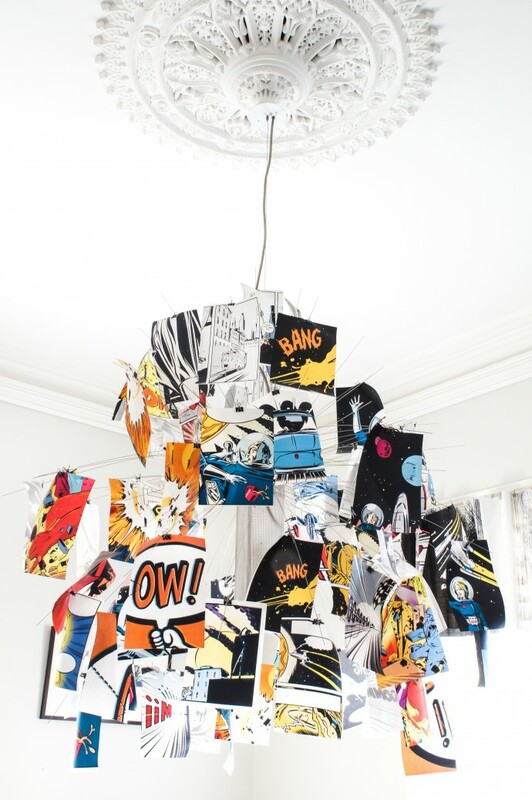 “I also really like the upstairs den, it’s the boys den but it’s more like the family room, so we often snuggle up in here for a movie.” ‘Bang Boom’ light fitting by Ingo Maurer Photo – Changwei Dean. Production – Martine Harte. 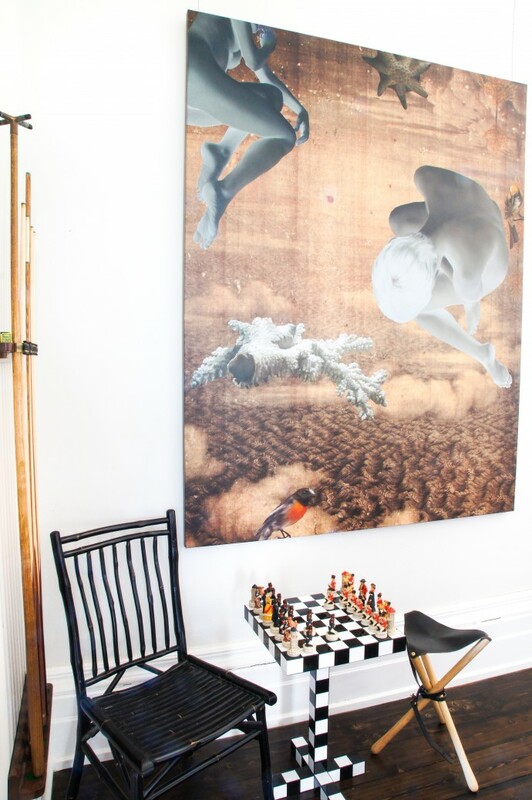 Painting by good friend John Young, chess table by Front for Mooi. Photo – Changwei Dean. Production – Martine Harte. “I love this painting from his double ground series, the background appropriates the last painting of Guiseppe Castiglione a Jesuit missionary who was caught up in the Emperors court and never allowed to leave China. 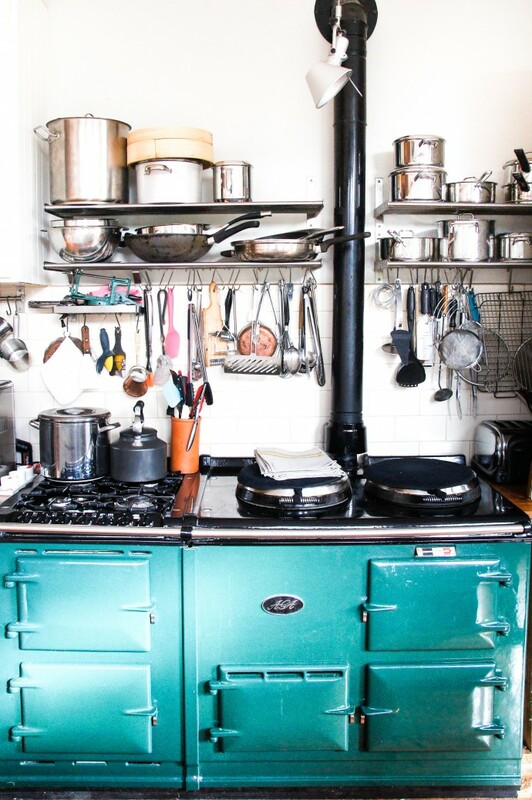 Hong Kong Chinese Australian John has also experienced the alienating experience of being an immigrant/emigrant.” The Aga Stove is loved like another family member. Photo – Changwei Dean. Production – Martine Harte. “It is such a more intuitive, sensitive way of cooking. It was designed by a Swedish engineer in the early 20th century. He was blind so he designed it to always know the location of what’s grilling and roasting, what’s baking, what’s simmering, poaching. It becomes your heater, it does the ironing, it does the drying, we don’t use our dryer. It seriously is like a person, I’ve just fallen passionately in love!” New Zealand artist Robert McCleod artwork depicts a queue and is strategically placed outside the upstairs loo! Photo – Changwei Dean. Production – Martine Harte. “I just thought it was so wicked, so much about alter egos, sexuality and all our neurosis so I just thought it’s very funny,” says Caecilia. 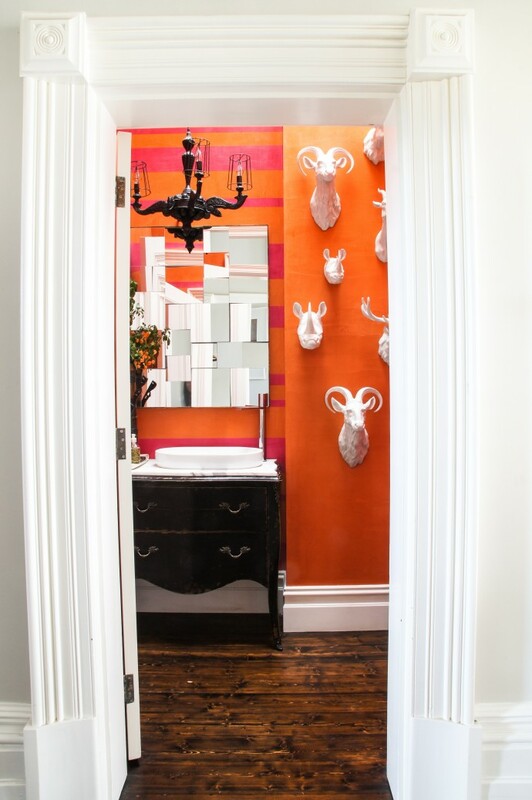 Powder room – Smoke chandelier by Mooi, Catalano basin and Milano taps from Rogerseller, ‘Meizai’ ceramic animals heads . Photo – Changwei Dean. Production – Martine Harte. The powder room transports the widely travelled family to their favourite place, South Africa. 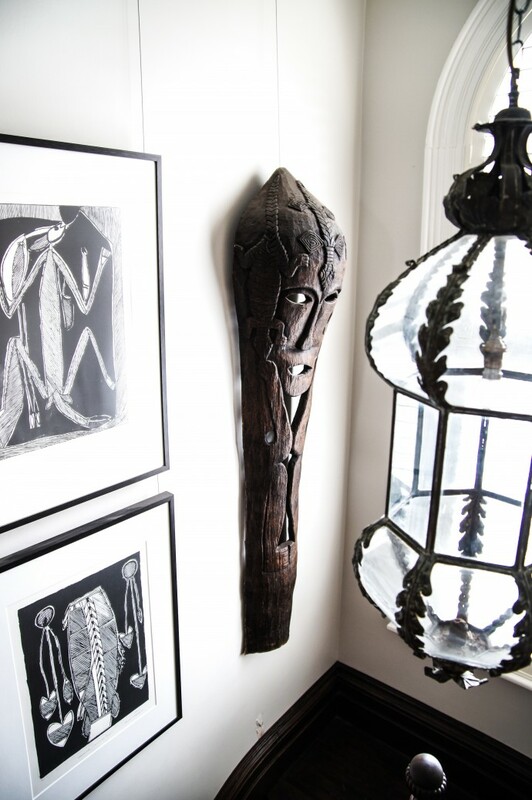 Coach lights from Iluka, Mask from East Timor. Photo – Changwei Dean. Production – Martine Harte. 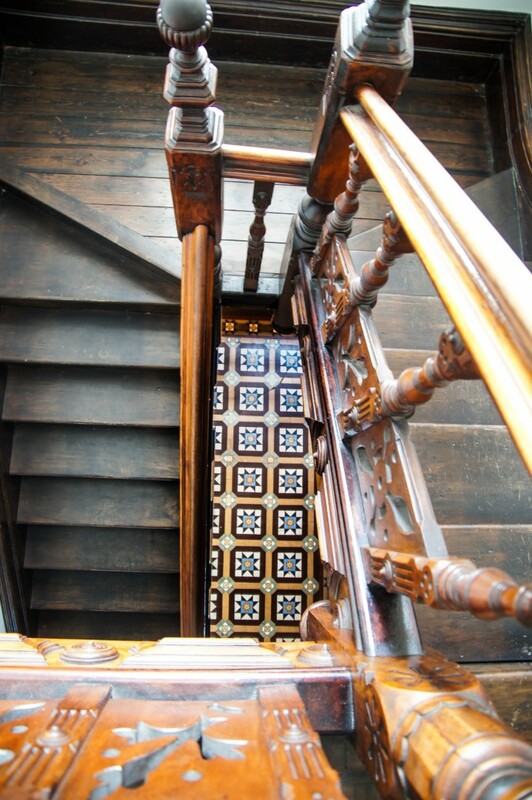 Original tessellated tiles and gorgeous staircase. Photo – Changwei Dean. Production – Martine Harte. Caecilia loves the ‘modesty panels’ on the staircase designed to obscure ladies ankles from stray glances from ungentlemanly gentlemen – as they ascended the stairs! Here’s looking at you kid.. Sir Cicero. Photo – Changwei Dean. Production – Martine Harte. 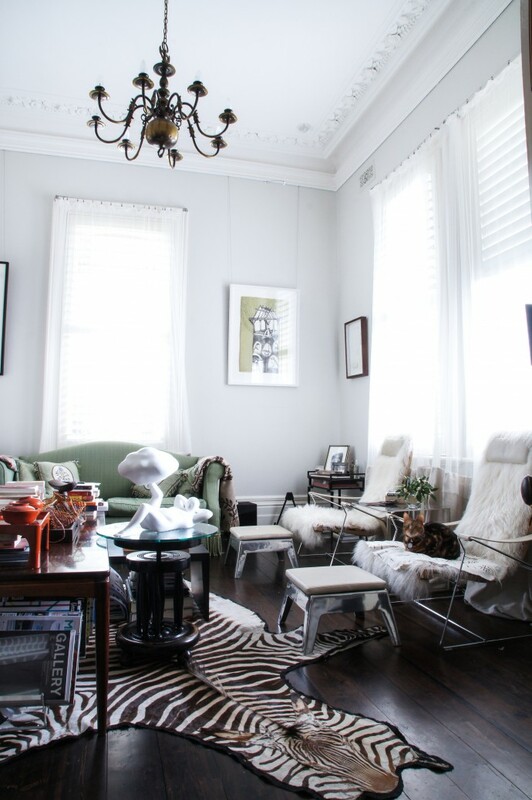 “One of the things I absolute love about the house is because we haven’t done the typical big box it feels much more purposeful. You decide to come into here and sit down and read a book or something. 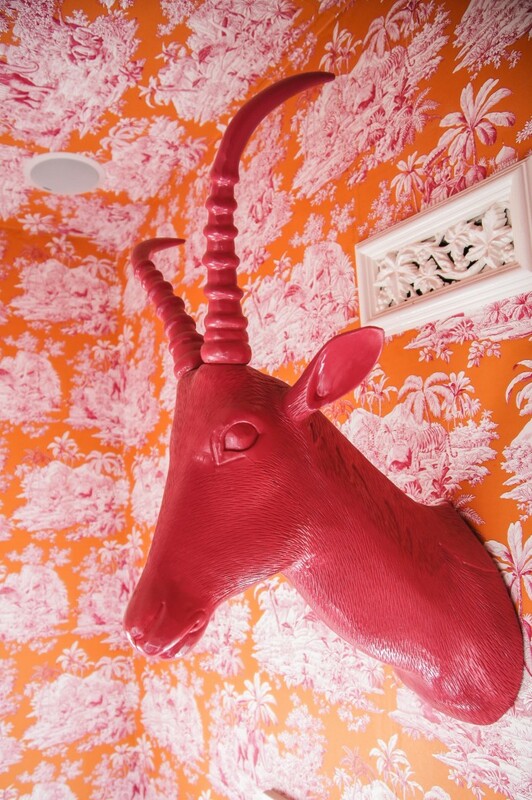 All the rooms get used.” Stair case leading to the tower, ‘Manual Canovas Bengal Paprika’ wallpaper. Photo – Changwei Dean. Production – Martine Harte. “The house is called Huntingtower and given the Yarra River is really close it is highly possible it was used for viewing. 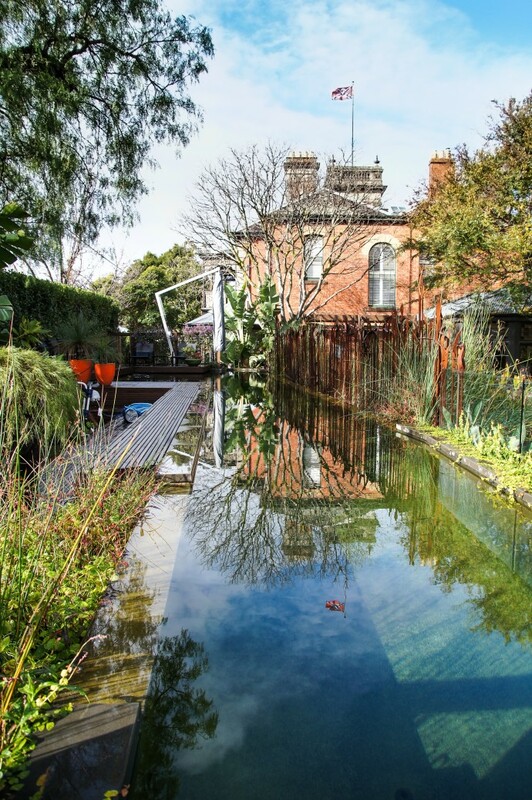 We did this wallpaper cause it’s got all this crazy hunting stuff and I loved the colour.” The garden with its natural swimming pool, cleaned by a natural eco-system using German technology. See if you can spot the reflection of the pirate flag captured by the lense of Changwei Dean. Production – Martine Harte. “We often get notes in out letterbox from people saying, I drive past your house most days and it just gives me a little kick to know what flag you have up. I particularly like the pirate flag and the Aboriginal flag,” says James. Next week more beautiful Australian homes. Tagged in Australian homes, Caecilia Potter, Good things, interior design, interior designers, Melbourne homes, provenance.